For many decades, or for that matter centuries, virtually every French kitchen had a special box for keeping flour ('farine' is the French word). This is one of those emblematic items that was in most kitchens of Provence, but now they are rarely found, especially in good condition...and they are highly collectable. This rare example dates from the late 1700s to early 1800s. This 'fariniere', made of walnut, with pine at the back, is in the traditional early 'box' shape with a sliding front panel. This antique farinere was hand-crafted with a charming naive carving of a flower filled urn on the sliding panel and more flowers at the top and bottom This fariniere is unusual in that it was intended only to hang. 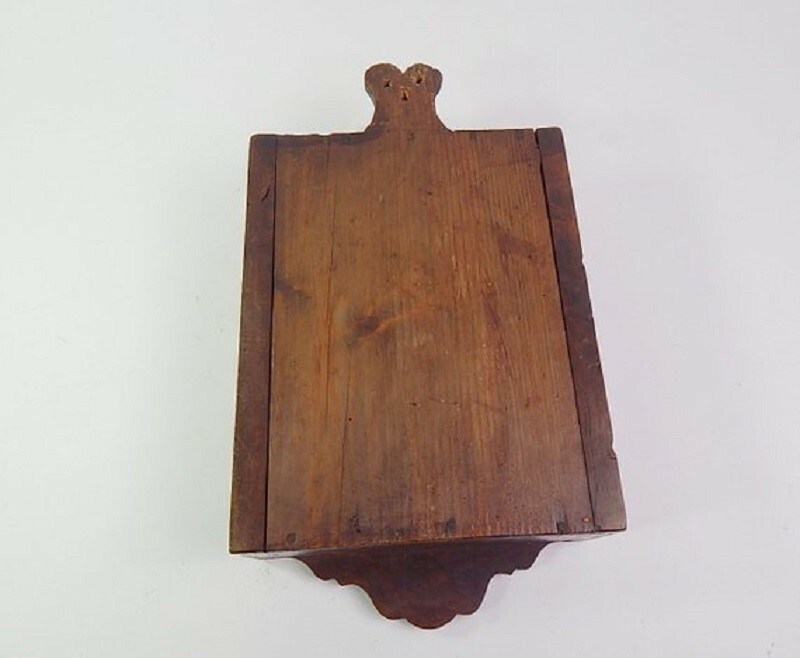 This fine box, with its charming decoration is in excellent antique condition, with some expected woodworm and minor signs of use. (Please see photos for additional condition information.) It would be a fine decorative piece which would add an authentic 'Provencal' touch to a French kitchen decor. The measurements are 16 inches from top to bottom at the front, 3 1/4 inches deep, and 8 3/4 inches wide across the front. Please look at the photos carefully to see condition, as our photos form part of our description... if you would like to see more, don't hesitate to ask. Shipping from France for this item is £21.50 to the UK and Europe. Your parcel will be professionally packed. Shipment will be by French Colissimo International Airmail which includes insurance, a tracking number and delivery on signature for added security.